Hill Inlet and Whitehaven Beach. Photo by Peter Lik. 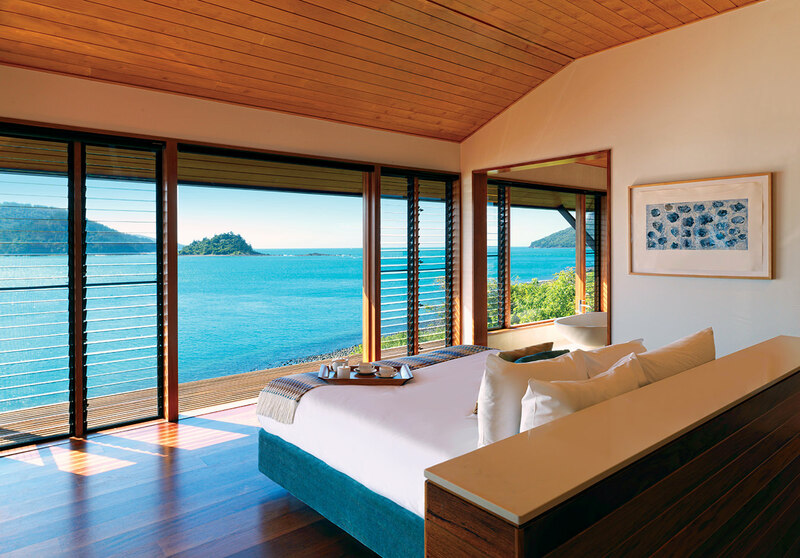 One of Qualia resort’s Windward Pavilions, looking out over the Coral Sea from Hamilton Island. Heart Reef, Great Barrier Reef, Queensland. Photo by Adrian Brown. 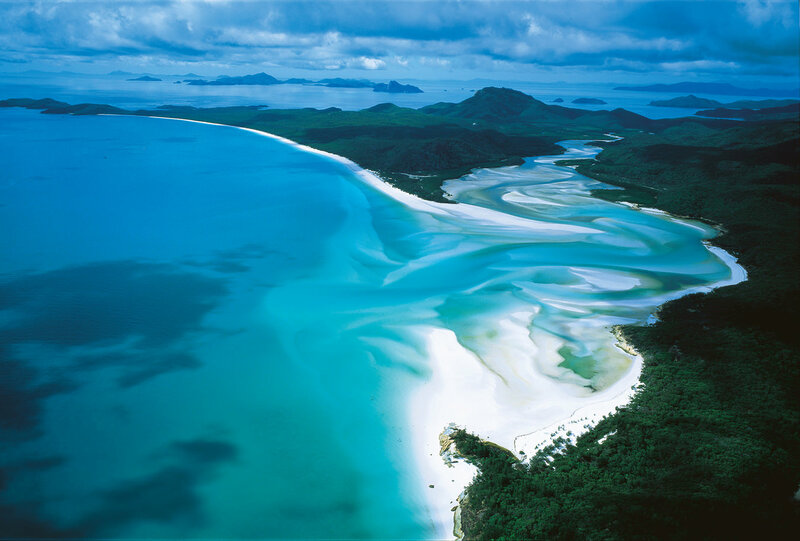 Whitehaven Beach and Hill Inlet. Photo by Paul Ewert. 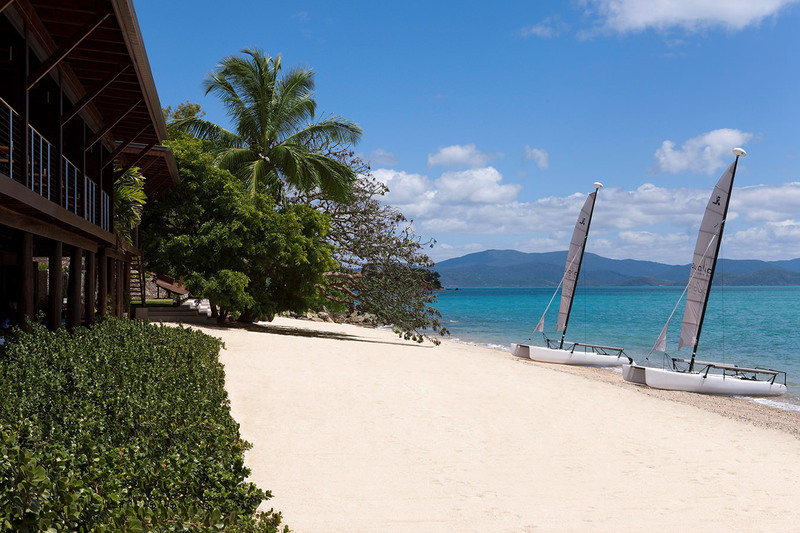 Pebble Beach at Qualia resort. 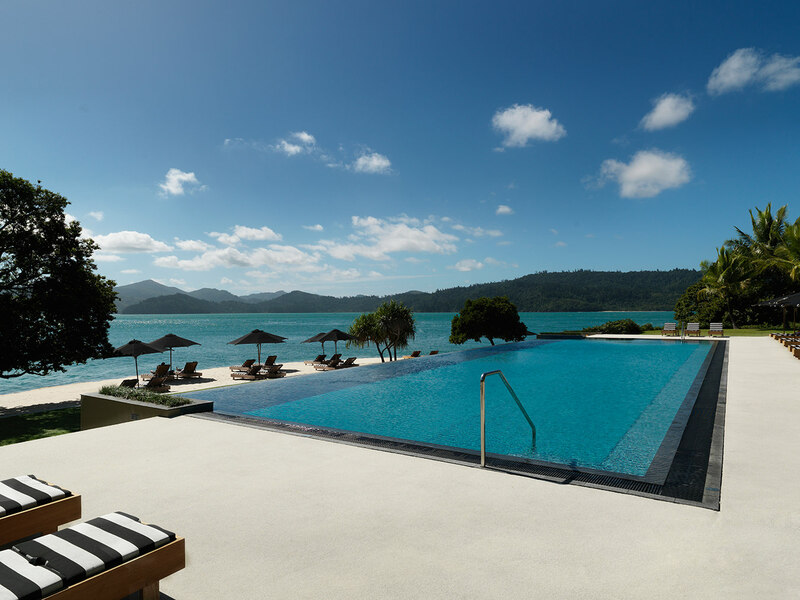 Pebble Beach Pool at Qualia resort. An aerial view of Hamilton Island. Photo courtesy of Hamilton Island. A Reefworld excursion on the Great Barrier Reef. Photo by Peter Lik. Just over a year ago, the Australian state of Queensland completed an 18-month-long, $24.5-million project to spruce up the coastal town of Airlie Beach. The landscaping spit-and-polish was a complement to Airlie’s existing central lagoon—an enormous expanse, containing four-and-a-half million litres of fresh water—which overlooks the Coral Sea. Still, no matter how much things change they tend to stay the same. As refreshed and modernized as Airlie may be, Hamptons chic it is not—though that doesn’t mean it wants to be. The town embraces the laid-back vibe that has defined it for decades. “Flashpackers”, the new echelon of upmarket backpackers, haunt the cafés, the Thirsty Camel drive-through liquor store opens at 9 a.m., and a smattering of nightclubs allow dancing on the tabletops. And so, while Airlie continues to party, it’s worth moving swiftly east to the unspoiled Whitsunday Islands that lie beyond. The group of 74 islands, varying in size, are so named because it was Whit Sunday (the seventh Sunday after Easter), June 3, 1770, when Captain James Cook first sailed by. 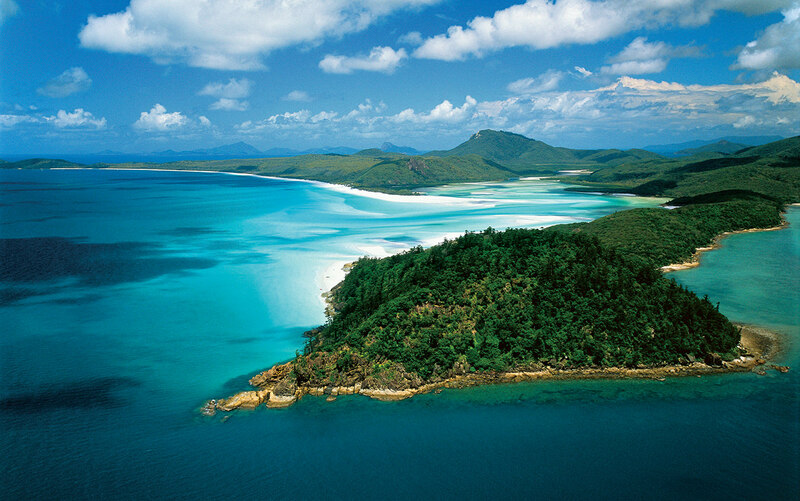 Today, almost half a million travellers visit the Whitsundays annually. 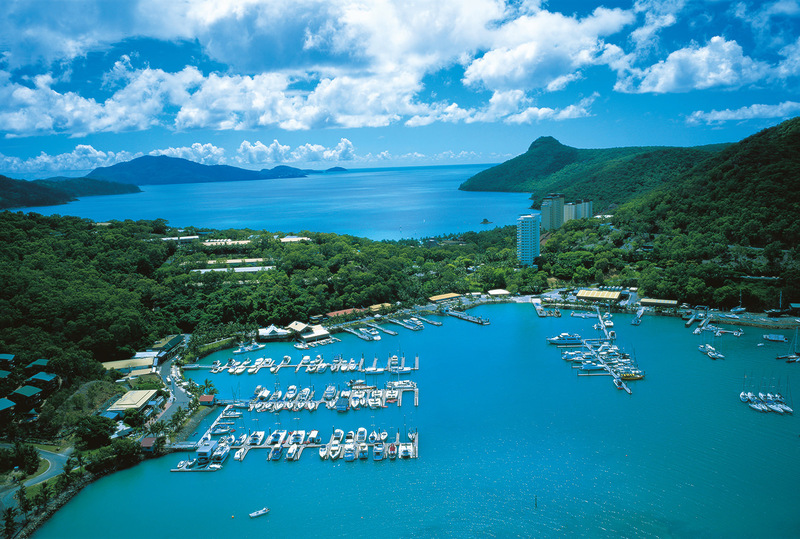 I drop anchor at the most populated of them all, the 750-hectare Hamilton Island, a sailors’ paradise located 16 kilometres off the Queensland coast. As I dock at the yacht-filled Catseye Bay, a trio of white wild cockatoos strut along the marina. The bay is lined with shops—a bakery, an ice creamery, a fish-and-chip joint—and I’ve found my miniature version of the Hamptons here in Hamilton. At first glance another eight-letter h word—Honolulu—comes to mind here, due to a handful of high-rises that appear eerily similar to those cookie-cutter hotels pervading the beaches of Waikiki. Here, they are private apartments, the only high-rises on all of the Whitsundays, and most likely the last. Since their development, the privately-owned Hamilton Island was bought from its prior owner, Keith Williams, and revamped into a distinctly Australian resort town. Even from the first step into Qualia’s lobby, complete with wide views overlooking a long infinity pool and the sea beyond, it’s clear that the resort prides itself on the exquisite. General manager Matthew Taverner moved to Hamilton Island after working in Zambia, Bali, and, most recently, Hong Kong. “I wanted my kids to climb a few trees growing up. That’s why we’re here,” he says, gesturing at the view. “We just saw our first humpback whale of the season the other day.” Taverner notes that the renowned glowing sunsets are not special occurrences but the norm, and that evening, back at my pavilion balcony, I watch the slow burn of mauve and orange. The only noises, save for the wind, are from the whirring of passing helicopters coming and going from Qualia’s private landing pad. 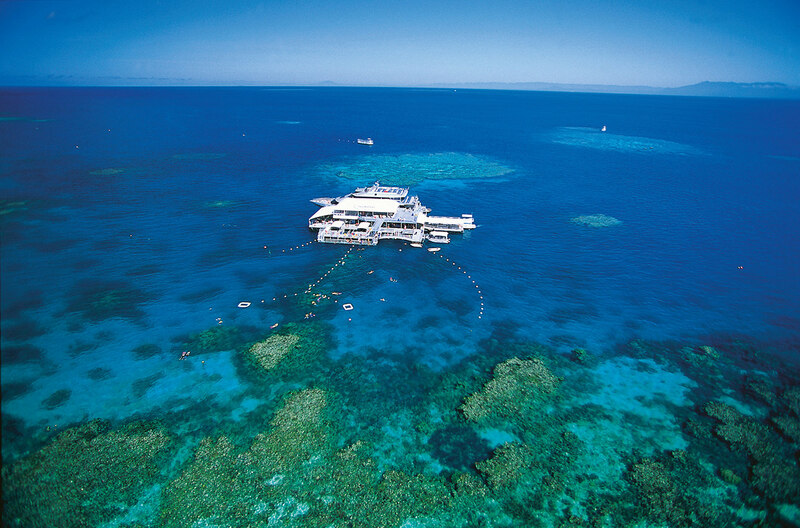 It’s no surprise; by air is the finest way to take in the chain of reefs known as the Great Barrier. 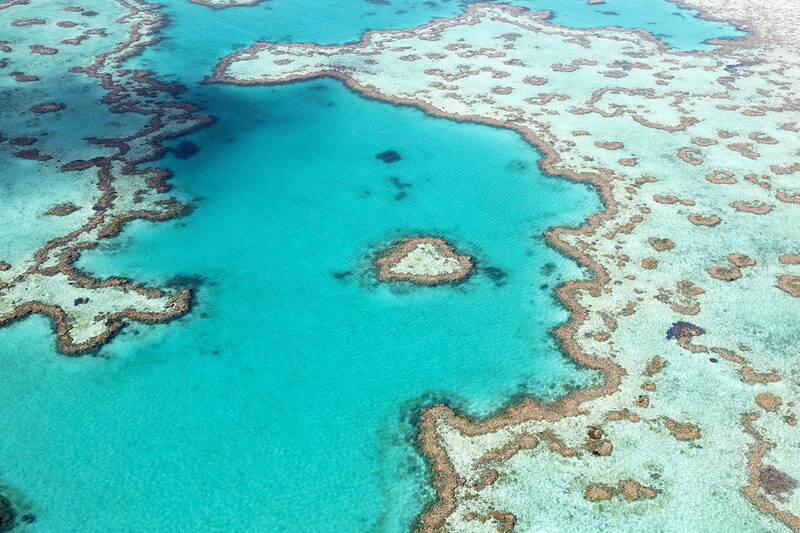 Here is the beginning of the world’s largest coral reef, the Great Barrier, which continues north and comprises more than 2,900 individual reefs. While some preach that these islands are not the start of the Great Barrier Reef, do not become their disciples; the Whitsundays are indeed bordering the reef, and snorkellers can also view much in the way of sea life and coral in “the fringing reef” that directly surrounds Whitsunday Islands National Park. The Great Barrier Reef, one of Australia’s natural treasures, was on its way to UNESCO’s list of World Heritage in Danger sites, but with the nation’s attention to conserve this delicate ecosystem, the decision was postponed in June of this year until 2015. Accessing the reef’s more remote, abundant stretches can be done either on a charter yacht for a few nights, exploring the smaller outer islands along the way, or in a day, on one of Cruise Whitsundays’ eco-certified excursions. One windy morning, a high-speed Cruise Whitsundays catamaran delivers me to a pontoon on Hardy Reef, located in the outer Great Barrier Reef. There is much to do, but only one must-do: slide on a snorkel, a wetsuit, and a pair of flippers, and submerge. Here is the beginning of the world’s largest coral reef, which continues north, past Cairns and Port Douglas, and comprises more than 2,900 individual reefs. Over 1,500 fish species and 360 hard corals make up this winsome underwater world, along with 30 species of whales and dolphins and six types of sea turtles. Underneath the waves, I join knuckle fish, as well as tube coral and its twisting brain-coral counterpart. A large, gelatinous Maori wrasse fish weighing around 300 pounds floats by with glazed eyes, but the most intense thrill might be gazing into the abyss that lies just over the edge of a coral cliff, where the sea bottom drops and disappears into a black, fish-spangled nothingness. Crawling back on deck is a reminder of the gale-force winds and choppy seas, and so I wrap up the trip with a helicopter ride, launching off from a neighbouring pontoon and travelling 30 minutes to Hamilton Island. From above, the clear water acts like an azure looking-glass to the coral networks below. Flying over Heart Reef—a famed seamark that makes it onto postcards, discovered in 1975 by one of Air Whitsunday’s pilots—is to note how tiny this heart-shaped icon seems to the naked eye, just one piece of coral in a sea filled with unimaginable masses of coral bodies. There’s still another flight I need to take before the one that takes me home: overtop one of the most pristine stretches of beach in the world, Whitehaven Beach. Swaths of pure white silica sand cover the seven-kilometre beach, which borders the turquoise-blue Coral Sea. From a decade ago, when I first visited this beach, my only memory is of a sand-dune walk to the expansive sight of Hill Inlet and the murmur of hundreds of scuttling baby crabs on the sand. This visit, there are no crabs in sight and, rather than an arrival by sea and by foot, I take an Air Whitsunday seaplane. Hovering over the low-lying islands that stud the ocean like green thumbtacks on a turquoise corkboard, I see two thin, coloured half-orbs refract over the sea—a double rainbow. The entrance to Whitehaven’s Hill Inlet is found at the northern end of the beach, where the waters shift and sculpt the sand with the changing tides. The effect is like a cross-section of a flooded hourglass; its swirling pattern could hold even the most disillusioned traveller in a trance.